Detected malicious programs can damage your computer and compromise your privacy. It's strongly recommended to remove them immediatly! 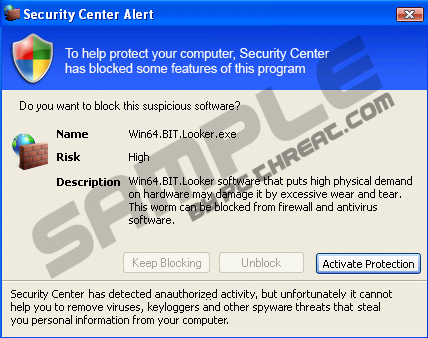 Quick & tested solution for AntiVirus AntiSpyware 2011 Fake Alerts removal. AntiVirus AntiSpyware 2011 will be in tray and will protect your PC from threats. Right click AntiVirus AntiSpyware 2011 icon to restore program. Your computer is infected with spyware and malware. Last scan results: 371 infected files found! Click this notification to fix the problem. Your have been infected by a proxy-relay trojan server with new and danger "SpamBots". You have a computer with a virus that sends spam. This is a mass-mailing worm backdoor thus allowing un-authorized access to the infected system. It spreads by mass-mailing itself to e-mail addresses harvested from the local computer or by querying search engines such as google.com. The IP 192.168.1.72 address that YOU are getting from Internet Service Provider (ISP) for YOU personal computer is on some major blacklist. Your computer has been used to send a huge amount of junk e-mail messages during the last days. You IP 192.168.1.72 will be marked in the Police log file as mass-mailing spam assist. Upgrading to the full version AntiVirus AntiSpyware 2011 It will eliminate the majority of Spam attemps. Description: Sft.dez.Wien is a virus attempts to spread itself by attaching to a host program, and can damage hardware, software or data in the process. This worm can be blocked from firewall and antivirus software. Security Center has detected anauthorized activity, but unfortunately it cannot help you to remove viruses, keyloggers and other spyware threats that steal you personal information from your computer. Buy Life Time Software License Discount offer! 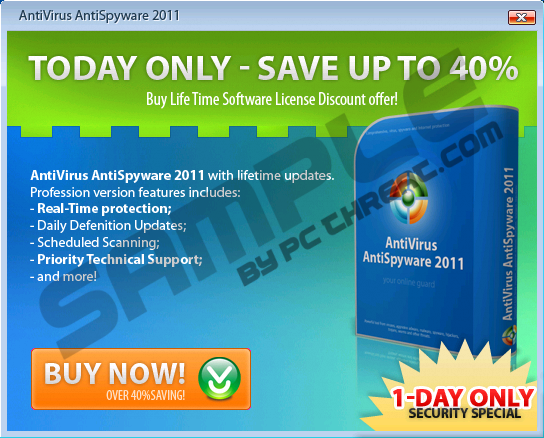 AntiVirus AntiSpyware 2011 with lifetime updates. Description: Win64.BIT.Looker.exe software that puts high physical demand on hardware may damage it by excessive wear and tear. This worm can be blocked from firewall and antivirus software. Don't risk believing any of these fake alert messages. If the fact that it comes from malicious rogue application weren't enough, then the poor spelling and syntax of these notifications should finally convince you that AntiVirus AntiSpyware 2011 is a total scam. I did remove this by going to add/remove programes -- so far so good but will wait and see if it returns. Add/remove programmes does not work, it says it's uninstalling but runs again straight afterwards. I never believed the Chinglish garbage from the start, but unfortunately this was not my computer. you are right - Britain is a total rip off, nobody should ever pay for any computer software of any type whatsoever.